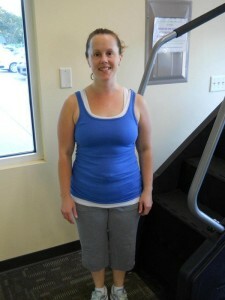 Starting in January 2011, Chrissy lost 15lbs and almost 6% body fat in about 7 months. She is now working towards losing another 10 lbs to meet her goal weight of 115lbs. Last year was a turning point for me. I had reached the heaviest weight ever. I was in the biggest pant size I had ever been in, and I was sick and tired of feeling bad about myself. So I decided I needed to make a change. I joined Anytime Fitness in January 2011. I know what everyone thinking of people who join at the beginning of a new year. I even feared it a little myself. I didn’t want to turn out to be one of those people who make a New Year’s resolution to lose a few pounds and join a gym; only to lose two pounds and go to the gym for a month and then never go back. I was determined to make a lifestyle change. When I came for the tour Katie got me really excited about joining, and it was motivating to get me started. I got my first training session with Jessica. I realized that I had no idea about how to workout. All I really could do on my own was walk on the treadmill and do some sit-ups. I took the plunge and signed up for three months of training with Jessica. This was the best decision I made. She showed me how to do so many different kinds of exercises. I even went back into the weight room (which I never would have stepped a foot into if it wasn’t for her). After about four months I was down 10 pounds and one pant size. I felt great. I t was also motivating to have other people notice this change in my body. Jessica even coached me about my eating habits and how to make better choices. After that, I signed up for more sessions with her. I was really excited about working out because I knew that I had a plan about what I was going to do each time I was there. I eventually lose 7 more pounds. I have really made a lifestyle change. Working out is not just part of my weekly routine. If I go more than a few days without working out I really feel sluggish. I have more energy and have even been sleeping better. I actually look forward to going to the gym (every once in a while). I have participated in two 5k runs this summer. I am very proud of how I finished in both of the races. I have the typical challenges in keeping the weight off, but I don’t let it consume me. I have had the right training so that I know what I need to do to get my body back into shape. I am hoping to continue on this path so that I will never return to the person that I was before I joined the gym. I love the new me! Previous Post:Success Story- Cheri B. Next Post:Success Story- Erica K.